ELVSTROEM (AUS) (Bay 2000-Stud 2005). 10 wins-1 at 2, Victoria Derby, Gr.1. Sire of 451 rnrs, 270 wnrs, 12 SW, inc. Hucklebuck (VRC Emirates S., Gr.1), Carrara, Outback Joe, Go the Knuckle, Shanghai Warrior, Viking Hero, Brilliant Bisc, Instalment, King Creole, Innocent Gamble, Kullu, Viking Legend, SP Danestroem, El Spark, Throw the King, Don't Get Excited, Gold Medals, Goodpack, Langridge Street, Miss Elvee, Pull No Punches, The Other Harv, etc. King Triton (g. by Elvstroem). 9 wins. See below. SPECIAL DANE (Danehill). 5 wins-1 at 2-from 1000m to 1600m, A$558,930, VATC CF Orr S., Gr.1, Sandown Guineas, Gr.2, Robert Hunter H., MVRC Brisbane Lions H., 2d STC Todman Slipper Trial S., Gr.2, VRC Chivas Regal S., Gr.3, VATC Rubiton S., Gr.3, BTC Stakes, L, GCTC Magic Millions 2YO Classic S., L, Qld Tatt's RC Foster's 2YO H., 3d STC Skyline S., Gr.3, Australian Equestrian Team 2YO H. Sire. Guardia. 3 wins at 1100m, 1200m, A$114,700, NSW Tatt's RC Safilo Eyewear H., STC Japan Racing Association Trophy H., Castle Hill Tavern H., 3d STC Sunkist H., Schweppes H.
Sea Folly. 3 wins. See above. Lunar Express. 6 wins to 1200m in Aust. Barraboy. 2 wins at 1200m in Aust. Ujugigwancha. 4 wins from 1700m to 1900m in Korea. Hazeration. 2 wins at 1200m, 2000m in Aust. Srinika. 3 wins at 900m, 1200m to 2014-15 in Aust. Not One Doubt. Winner at 2 in Aust. Danehill Special. Placed in Malaysia and Singapore, 3d Singapore TC Ascot Authority Trophy. Kullamullafulla. 2 wins at 1000m, 1400m in Aust. Free as Air. 7 wins to 1300m, A$118,675, QTC Southside Ford H., 2d BTC City Pacific Finance H., Patrick Terminals H., QTC Bryan Byrt Ford H., 3d SAJC Feltex Carpets H., QTC Barrosa Boy H.
Regal Reason. 2 wins at 1100m, 1200m, BTC Trevor Gillmeister P.
Hubcapper. 4 wins at 1000m, 1200m, 2d AJC Malaya 2YO H., North Sydney H.
Hyphenate. 3 wins-1 at 2-to 1200m in Aust. Blazing Glory. 2 wins at 1200m in Aust. Our Motive - Take Great Success (Mac.). 2 wins at 1100m, 1300m in Aust. and Macau. Royal Lionne. 2 wins at 1100m, 1400m, 2d BTC Rubbermaid H.
Irish Air (Air de France). 3 wins at 1400m, 1600m, A$150,050, AJC Exchange H., Birdcage H., WATC Burabudy H., 2d STC Gloaming S., Gr.2, Bunbury RC AHA Cup, 3d AJC Champagne S., Gr.1, Expressway S., Gr.2, MVRC Waterford Crystal Mile H., Gr.2, STC Pago Pago S., Gr.2, WATC Ascot Club H., Latin Saint H., MacAdam H., 4th AJC Hobartville S., Gr.2, Newcastle JC Coca-Cola Classic S., Gr.3. PARK PLACE (Royal and Regal). 7 wins-1 at 2-at 7f, 1m, Stockton Mayme Dotson H., L, Doncaster Royal British Legion S., 2d Bay Meadows Tizna H., L, 3d Solano James Wiggins H., L, 4th Ascot Fern Hill H., L. Producer. Lady Dara (Lord Gayle). 2 wins. See above. MUNITION (Military Plume). 5 wins-1 at 2-from 1200m to 2400m, A$138,910, Tasmanian Oaks, L, VATC Leica Show H., 2d TRC One Thousand Guineas, L, MVRC Horlicks H., VRC Empire Rose H., Sanderae H., MVRC Christmas Cake H., Magic 693 H., Rare Spares H., 3d SAJC Ansett Australia S., L, VRC Janet Orr H., Neat N Trim H., MVRC Happy Valley H., Be Brisk and Fit H., Kingston Rose H., VATC Glenhuntly H. Producer. Race Record: 64 Starts 9-9-8 A$321,600. 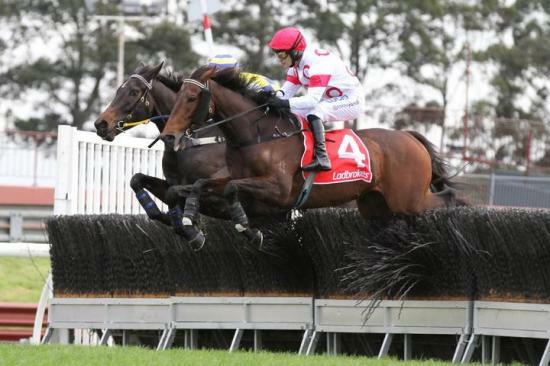 9 wins from 1550m to 3500m, A$321,600, to 2014-15, 2d MRC Great Southern S/chase, 3d Ballarat TC Australian S/chase, Bendigo JC Mosstrooper S/chase, Warrnambool RC Crisp S/chase, Thackeray S/chase, Brierly S/chase.